Every year for the past several years, over 9,000 youth have walked through the doors of the Juvenile Court of Memphis and Shelby County at 616 Adams. These juvenile defendants, predominantly young black males, often waive the right to counsel and other due process protections, and lack the support they need to navigate their way back to community life. To help reverse this trend, a new partnership between Knowledge Quest and Turning Point Partners is working to engage youth in their schools, before the state gets involved. Through a grant from the Pyramid Peak Foundation, Turning will spend the next three years training teachers, parents, and volunteers at Knowledge Quest schools in the principles of Restorative Justice. 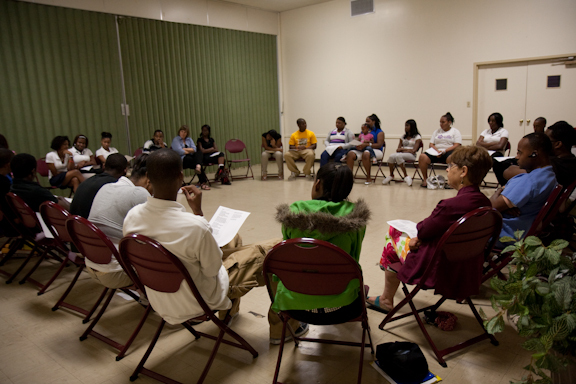 Youth participate in a circle at Abundant Grace Fellowship in Memphis. Restorative Justice is an alternative to the punitive justice system that seeks to address the basic needs that lead children to harmful decisions and repair the harm experienced by victims of an alleged offense. With the help of a trained facilitator, the child works to develop a personalized action plan based on their strengths, in a circle that includes parents, victims, and other community stakeholders, such as neighbors, teachers and faith leaders. These opportunities for dialogue are rare in the punitive justice system, but many jurisdictions are starting to realize their potential. During a partnership with the Bridge City Center for Youth in New Orleans, Handley and her team were able to help reduce recidivism from 77 to 6 percent among detained children who participated in the program. She hopes the partnership with Knowledge Quest will start something similar in Memphis, before the child faces detention. Active in the 38126 and 38106 zip codes, Knowledge Quest provides enrichment and case management for students at four schools in its “Kids Zone” corridor on Walker Avenue. By training Knowledge Quest staff in Restorative Justice, Turning Point is helping these South Memphis neighborhoods address youth violence without resorting to criminal sanctions. “People are more productive, cooperative, happier and likely to make positive changes when those in authority do things in contact ‘with them,’ rather than ‘to them’ or ‘for them’,” Handley says, emphasizing her collaborative approach. As partnerships like these continue to take root, the number of children walking through the doors of 616 Adams will give way to a new generation of youth ready to thrive in their communities.